During the months leading up to your wedding day, you will find that there are lots of celebrations along the way. From the engagement party to the bridal shower, there is just so much to look forward to. One of my favorite pre-wedding parties would definitely be the bridal shower! Because what's not to love about gifts, goodies, and girl time? And so seeing that wedding season is fast approaching, I thought it would be exciting to create a fun and festive look for a bridal shower. So, we teamed up with Freixenet sparkling wine on this creative, celebratory shoot. And lucky for me, Lauren Rae Photography was there to capture every pretty detail. Think mini bottles of bubbly, polka dots, and paper flowers galore! Oh, and a mimosa bar. Need I say more? Because nothing says "let's celebrate" quite like popping open a little bottle of bubbly. And these, my friends, are some of the cutest bottles I've seen! Not only are their black bottles chic and stylish, but it's super easy to spruce them up and make them yours. Things to be on the look out for: DIY florals (designed by yours truly), sparkly table linens, stripey straws, and the prettiest custom stationery suite. Oh, and I can't go without mentioning my love for this chandelier! Some of my favorite details include the handcrafted paper flowers created by Paper Flora. Not only did this add a pretty pop of color to our backdrop, but I really love how this added a textural element as well. Sparkly linens by Candy Crush Events, really added the overall look and feel, while coordinating stationery designed by Paperwork Envy allowed me to carry this beautiful botanical theme throughout. Oh, and did I mention my love for these bubbly bottles? 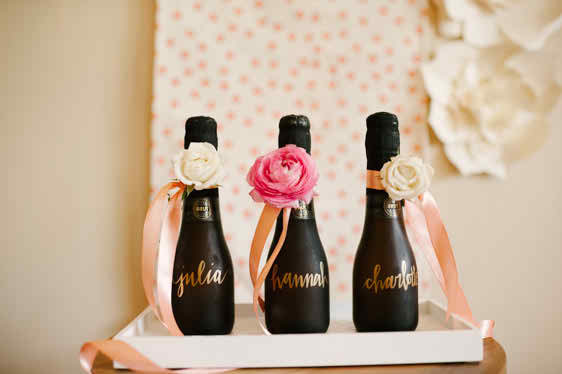 These mini bottles were easily dressed up with a little bit of satin ribbon, fresh florals, and gold calligraphy. Freixenet’s matte black mini bottles are not only super cute, but they also make a lovely addition to any pre-wedding party or even the wedding itself. Hello, cutest party favor, ever! So as you can see, I had a little bit of fun with this. Just a little. Just a smidge. Okay, who am I kidding? I had a blast! I mean, someone had to drink all the left over bubbly. Here's to hoping that your bridal shower is just as fun! Oh, and don't forget the confetti! P.S. Be sure to follow the Freixenet Wedding Board over on Pinterest where they're sharing all kinds of fun entertaining ideas. Special thanks goes to: Lauren Rae Photography for the photos, Fifty Flowers for the wholesale flowers, Candy Crush Events for the gorgeous sequin table cloth and the runners, Lauren Rae Photography for the custom calligraphy on the bottles and bags, Paperwork Envy for the Custom Stationery including invitation, favor tags, coasters, bridal bingo sheets, cupcake toppers, signage, Paper Flora for the paper flowers, Cost Plus World Market for the white chairs and flatware, and kate spade new york for the dot place settings and dot champagne flutes. This post was sponsored by Freixenet. However, all opinions are my very own. 7 Comments " Pop, Fizz, Clink! Bridal Shower Inspiration "
Love how pink and girly this shoot is! I would love to go to a party this fun! I have surfed the net more than three hours today, yet I never found any interesting article like yours. It's worth enough for me. Thanks. obsessed with those paper flowers! Absolutely lovely! Blush and gold are the perfect color palette!